The Game World is where the game action takes place.The Player Name of the current player is at the bottom left of the game screen. Your Frog Family and Tadpoles inhabit the bottom of the world, and the Bugs which your frogs attempt to eat pass by above.You help your frog family to eat by clicking on a frog to make it Hungry and then clicking again on a bug so that the selected (Hungry) frog will attempt to eat the bug by putting out its Tongue to eat. If you have chosen the right bug, then your frog will gobble it up and you gain points and other benefits. If you have selected an incorrect bug, then you will lose points and some of your 'power ups'. You can then choose to eat another bug, or you can click on a different frog to make it Hungry. The frog which is Hungry is drawn in a different color text (the name of the frog), and it is the frog which is hopping up and down the highest. The Hungry Frog is the only frog which will speak to you. The Hungry Frog speaks it's name (word) when you select it and periodically speaks its name as long as it is hungry. You can play the game without having to look at your frogs at all, if you use the space bar to move from frog to frog instead of the mouse. You can just listen to the frogs speak their names, and use the mouse only to attempt to eat matching bugs. You can always choose to select a new Hungry Frog by clicking on the frog with the mouse, but try using the keyboard controls as well. IMPORTANT: Bug Spawning is complicated and you can change Advanced Options parameters to change what sort of bugs spawn and when and in what quantity. See the Bug Spawning options slider description in the Advanced Options pages for details on Bug Spawning. As you progress though the game you move up in levels of difficulty. You can adjust lots of parameters to suit your play style (see Advanced Option Player Menu). At the start of each new level, you get a new family of frogs and a new dollop of tadpoles which comes in one big bunch. You always have tadpoles as long as you have either a Time Bonus or are correctly eating bugs with your frogs. 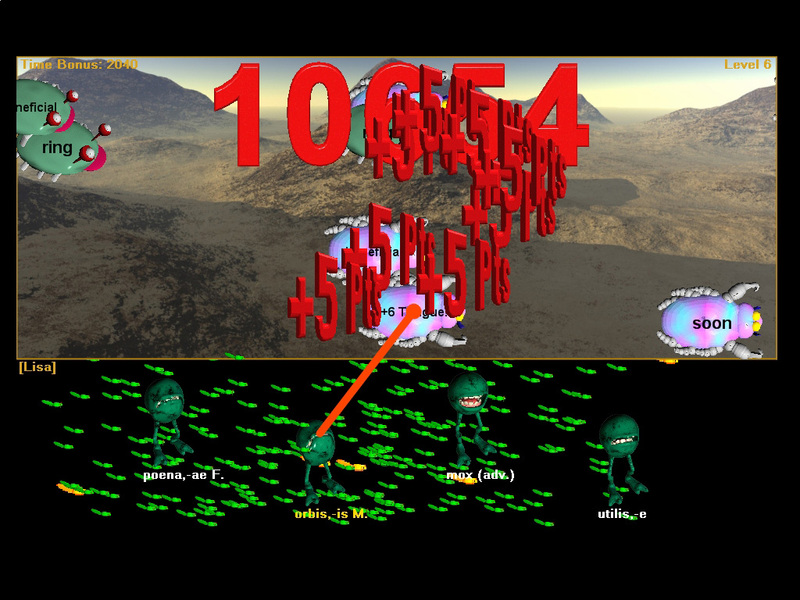 The screen capture above shows a game screen capture shortly after the start of level 2. The more tadpoles you have (green and yellow or otherwise) the better you are doing and the more likely it is that you will pass the level you are on and move to the next level of difficulty. You end the level you are on by clearing the screen of all the bugs. 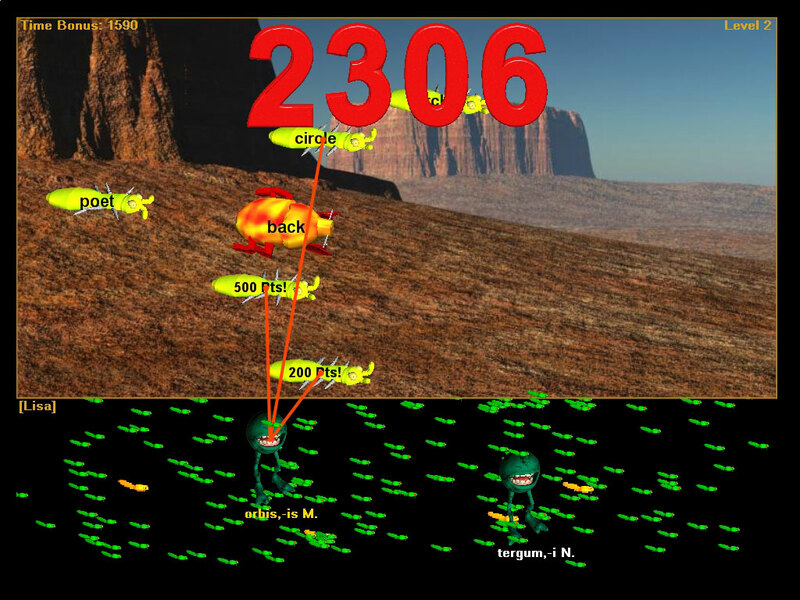 Then you move on to the next level if you have enough tadpoles (see Score Tally). It is most important that you have lots of tadpoles when your level ends, or you may not move to the next level. If you don't move to the next level of difficulty, then you replay the same level with new frogs and new bugs. If you really are having trouble you may even drop back a level. Your score and your level achievement are complementary, but you can have a higher score on a lower level in one game than in another game because of how many points you get during each level's play. See Bonus Bugs, and Time Bonus and Accuracy Bonus. Correct Attempts: You can eat as many bugs at a time as you can grab with your tongue. Different frogs can simultaneously eat different bugs if you are fast enough. The next screen capture shows a frog eating more than one bug. This is possible because in the example Hungry Frog Latin screen capture 'orbis' means both 'ring' and 'circle' so the same frog can eat two entirely different bugs. In the bottom right of the screen background you see a bunch of '+5' score markers which relate to how many points you got for eating the bug you just clicked on successfully. The more correct bugs you eat in a row, also the wider your frog tongue gets and the more points you get for every bug you eat. You can think of this as a kind of 'power up' like in a video game. You can also get wider tongues from Bonus Bugs. Missed Attempts: However, if you make an incorrect attempt to eat a bug then your you lose the 'power up' tongue width increases for ALL of your frogs - not just the one which made the mistake. You also lose the entire tongue bonus you may have acquired on that particular frog by eating Time Bonus bugs. You also decrease partially the time bonus bug tongue bonuses on all the other frogs. It pays to think before you eat, but you can quickly get your tongue power ups back up again, so if you miss a bug it isn't a big deal. You need to be careful at the end of a lesson though, because if you miss bugs when you have few tadpoles, then you may end up killing your last tadpole and the game will end. Missed attempts to eat bugs also cause you to lose score proportional to how big you tongue is at the time you try to eat the wrong bug. Your game score is continuously displayed in the center top of the game screen. It enlarges when you have scored new points and your score is increasing, and it diminishes in size when you have lost points and your score is decreasing. Remember missed attempts will cause your score to go down, as well as remove power ups. For example, in the above screen shot the Hungry Frog just ate two correct bugs with different meanings so the tongue width of ALL the frogs increased. In the next screen capture from the same game, the same frog eats another 'circle' bug matching the 'orbis' Hungry Frog and at the same time is eating two Bonus Bugs for bonus points. 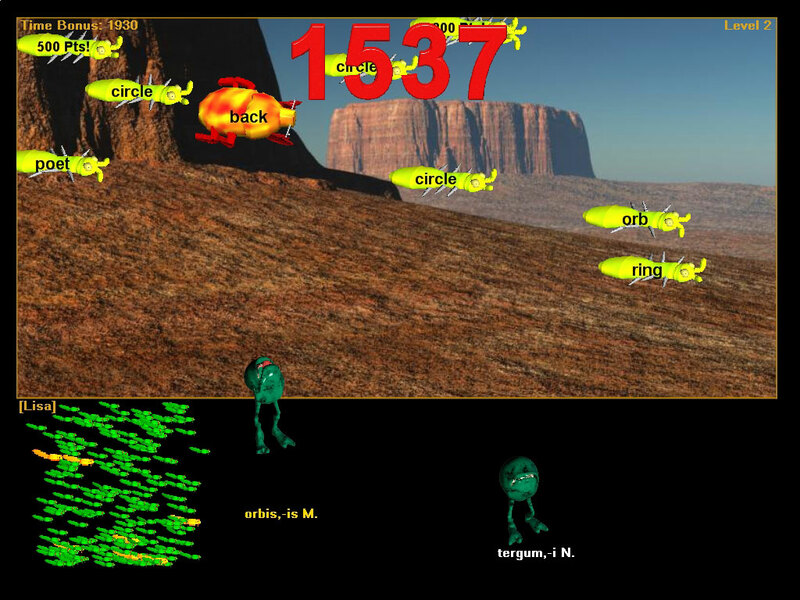 You can see that the tongue width has increased because the player has eaten several bugs in a row which are correct for the frog. Time Bonus: You can see from the same sequence of screen captures above from the same game (three screen captures in close sequence) that the Time Bonus has been decreasing. The Time Bonus is always going down over time, but you can increase it by eating Bonus Bugs with time bonus on them. It also may briefly increase when new bugs arrive on screen. As long as you have a time bonus left, you have at least one tadpole left and the game will not end. Once your time bonus runs out however, you must keep eating bugs correctly or else your tadpoles will all eventually perish. This is tied to your Accuracy Bonus. Accuracy Bonus: As long as you keep eating bugs correctly fast enough, you will keep your tadpoles alive and even increase their number. The more different bugs you eat in succession, the greater the number of tadpoles you get and the greater your accuracy bonus will be at the end of the lesson. 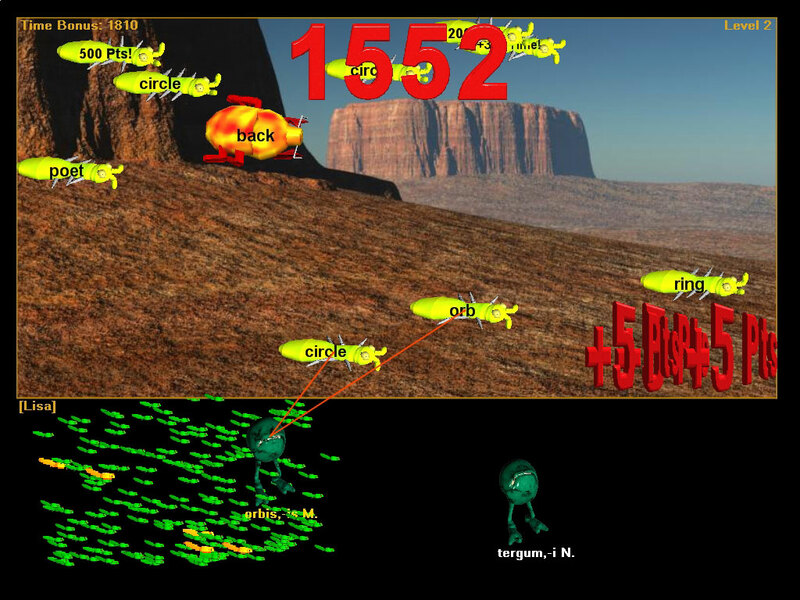 If you miss bugs and make wrong attempts to eat with your frog, then your accuracy bonus will decrease rapidly and so will the size of your tadpole school - and you risk ending the game early when your tadpoles run out. Accuracy bonus gives you tadpoles and a boost to your score at the end of each level, so try to keep eating bugs in succession that are correct. You can see that as more and more bugs are eaten correctly in succession that all the frog tongues get wider and wider and score points accumulate faster. Becuase the screen captures are only a limited sequence of frames, you do not see all of the points being acquired by the frogs. You should get a good idea of how the frog tongues grow for all frogs as long as you keep eating correct bugs. In this example, there were no Bonus Bugs with bonus tongue power ups - all the frog tongue width increase was due to accuracy bonus accumulation.There were plenty of tadpoles at the end of the level (when all the bugs were cleared) that it was easy to move to the next level. You can also see the time bonus decreasing. The game play is sped up in the animation because a lot of frames were cut out to make a small size movie for the web.